It’s been a busy time, so I’m a wee bit late in writing this post. But I’ll be doing the same actions in a few weeks, so it’s all “current”. Then the splits brought in, and everything set. I like to have the splits be queenless for three days before queen introduction. I figure it gives the girls time to realize they don’t have a queen, and then be ready to accept the queen when she’s introduced. 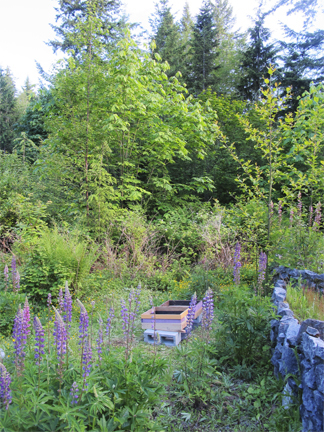 My new bee yards only get two or three hives. This way I can figure if everyone is happy. The landowner gets to see me come and go when I tend the hives. 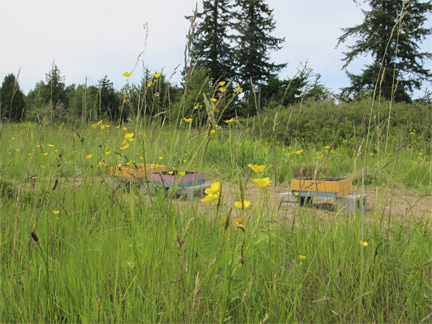 The bees get to see if they can find ample forage in the location. I get to see if there are any problems. 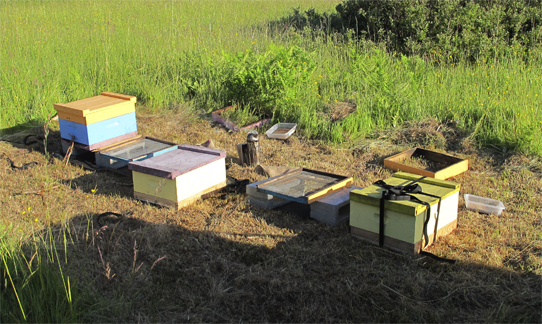 I’ve encountered pesticide issues and water issues (I get clarification now if a farmer says “oh it can get a little wet in that field” – beekeeping in a seasonal lake is not fun). 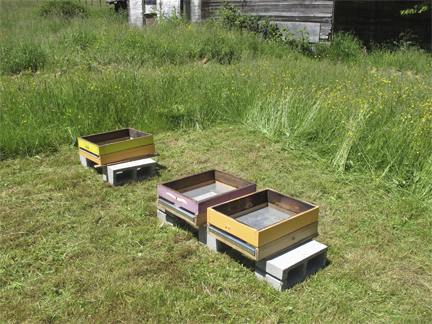 Two or three hives are easy to move. Ten or more would be a pain. Once a year passes and all parties are happy, I add more hives. 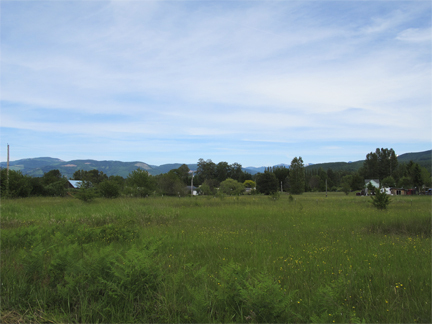 Although my bee yards are all within 45 minutes of my farm, the landscape can be very different: from mountains to flat agricultural lands. But no matter where they are, there is always tall grass. So my first chore is to cut the the grass. My area is fairly lush at this time of year. Things grow fast in these long days, and ample rain. I love my new power scythe. I have a hand scythe and always carry lawn clippers for quick fixes, but life is so much easier with power. I keep my hives on concrete blocks. I don’t need a forklift to move concrete blocks. My hives are placed with two hives side by side. Each pair needs three concrete blocks. Then, the bottom screens sit on these blocks. A “collar”. This is a 2-inch high “box” that sits on top of my hives. This is where they have a top entrance, and where I can put feeders, if needed, and insulation in the winter. This covers the top bars. It seems to stop down comb building in the collar. The bees most often cover this in propolis. Sometimes they remove it. 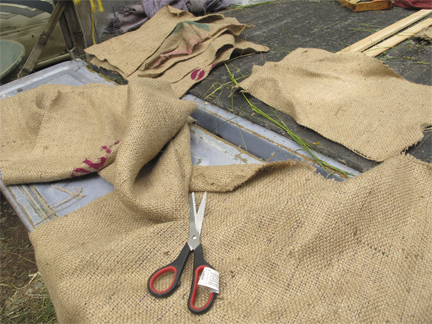 These are 1/8th inch hardware cloth folded in half and shoved on each side of the entrance. The resulting opening is about an inch or two. 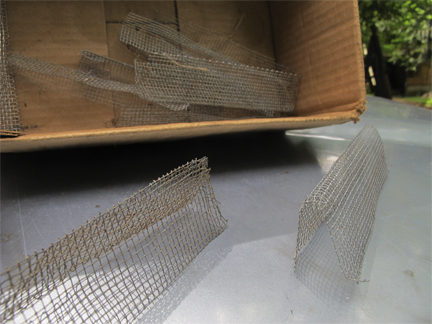 The wire allows for ventilation, plus the bees can still land at the entrance and walk over to the opening. I would leave mouse guards, but I’ve not had time to build all that I need this year. That will happen before fall. Three days before I plan to introduce the queens, I make overnight splits and move them into place. Then I wait, somewhat relaxed knowing everything the new queens and I need are in place. On day three I introduce the queens. I’ll go on about that in another blog. That’s the news for the moment from Brookfield Farm Bees And Honey, in Maple Falls, Washington. I’m spending my time now making more frames, wiring them, and hanging wax. We seem to be having a very good honey year here (about time), and the girls are filling their boxes quite quickly. Hopefully this will continue until the fall. How are things going in your area this year? The weather is so changeable these days. 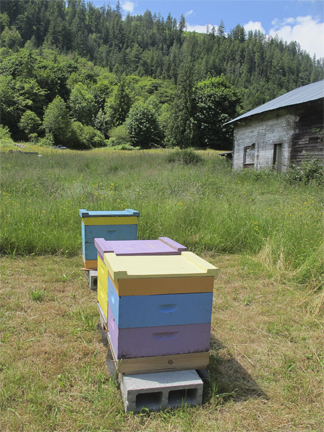 This entry was posted in Beekeeping, Brookfield Farm Bee Yards and tagged bee yards, Beekeeping, Brookfield Farm, Maple Falls, Prepare, Washington. Bookmark the permalink.